Until this morning I had never heard of the word. Writing with fire? Ah yes – pokerwork. I had vaguely heard of that. The art of drawing on wood with a hot iron such as a poker. Now I have a problem. What is it worth? Suppose you walked into a shop and saw the following wall hanging items on display. What kind of price would you expect them to be, or what would you be prepared to pay for them? Each is around 9cm wide but the heights vary. Just an idle query but I would be interested to find out. I have a life-long love affair with all things pyro, but I have no idea how much I’d pay for something like that. Maybe calculate your costs to make them (materials + time) and start there? No idea other than that. /me shrugs. If you are actually using pyrotechnics to make them, I might can point you in the direction of some of the types of people that would be interested in purchasing them. You might also check out this dude. He works a lot with pyrotechnics and has made some incredible art with them. Thanks for that C.F. They are not my work – I wish they were. It’s someone I know who makes them as a hobby and the thought crossed my mind that they might have a commercial value. The problem is that I have no idea what that value is. I’ll follow up on those links. Thanks again. They look too perfectly drawn to be made the old manual way. Lasers are used extensively for marking surfaces nowadays and these might have been made that way. 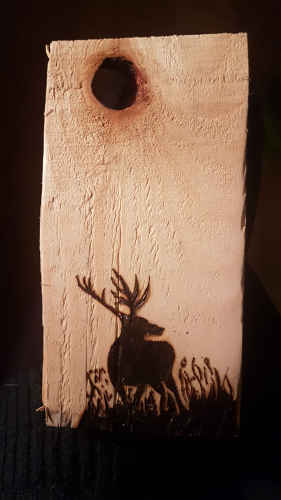 I have experimented with carbon-dioxide lasers (10.6 micron, infra-red) and it’s easy to char wood. If manually-made, I’d give a fiver each, laser-made perhaps 50 pence. They are all freehand done with a heated iron. The original image is traced onto the wood and then the outline, shading and details are all added by hand using the iron. £20 in the right shop – make the dragon a Welsh one and offer for sale through Wye Valley / South Wales outlets? We’re talking about a very small scale enterprise here, so shipping to Welsh outlets would add considerably to overheads. However, the concept of localised subjects is a great one. Thanks. 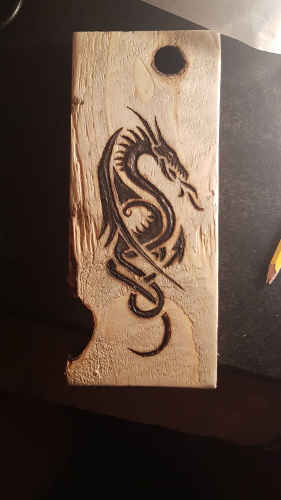 Make a search on ebay for pyrography art? Just did! Prices vary enormously but €20 seems to be around the average figure. If the subject matter is recognisably local [as Sackerson planted the seed!] then that would add to a souvenir value? As a sawmiller and purveyor of sawmills I can tell you the wood behind the Owl was milled with a circular sawblade…. Yup. Mass produced packing cases [or pallets – not sure which]. In plentiful supply so apart from time and a drop of electricity, overheads are nil. As with any artwork, they’re worth what someone is prepared to pay for them (or more accurately, what two people are prepared to bid in competition). The ‘time & materials’ basis doesn’t work – if it did, the ‘Mona Lisa’ would be worth around $10. I admire all such craft-skills, having none myself, but also know that most such artisans will never achieve payment-levels adequate to reflect the skill, expertise and creativity involved in their art. I have been giving this a bit of thought, and the ideal would be to produce local scenes for flogging to the sheep tourists. That way it’s arty but also has a local appeal. Heh! I saw you had visited Farcebook before dropping by here! The deer was in fact given to a friend but I’m sure she can whack up another. I told her to read this post but don’t know if she has gotten around to it yet. A new, exciting and profitable hobby to while away one’s declining years?